In a large bowl, combine the shrimp, bell peppers, onion, olive oil, and spices. 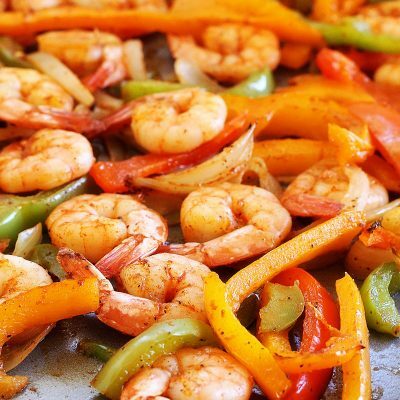 Stir with a large spoon and make sure all of the shrimp, peppers and onion slices are coated. Drizzle a baking sheet with olive oil and spread the shrimp mixture on top. Bake for 10 minutes and then turn the oven temperature to broil; then cook for additional 2 minutes or until shrimp is cooked through. Add the tortillas to the oven to warm while doing this step. Sprinkle with cilantro and enjoy!